Whether you are an experienced user or a first time buyer, it is vital you are aware of the rules and regulations on 4x4-drawn trailers. Richard Bradley reports. Drivers have to be aware of the ’dos and don’ts when towing a trailer. For most farmers and smallholders, a 4x4-drawn trailer provides an efficient way of transporting anything from livestock and materials, to plant and equipment. Operators, however, have to make sure they stay on the right side of the law to avoid large fines, penalty points and potential accidents. To clarify what you can and cannot currently do with your car, 4x4 or van and trailer combination on UK roads, we take a look at the basics. Licencing regulations changed on January 1, 1997. Drive a car, van or 4x4, with a maximum authorised mass* (MAM) of 3,500kg and tow a trailer up to 750kg MAM. Tow trailers over 750kg MAM, as long as the vehicle and trailer’s combined MAM does not exceed 3,500kg – this rule basically only applies to cars and caravans or small trailers. Before this, drivers who passed a Category B car test were granted ‘grandfather rights’, allowing them to drive a car with up to a 3,500kg-capacity trailer (Category B+E), a goods vehicle weighing up to 7.5 tonnes (Category C1) and a minibus (Category D1) – not for hire or reward. Passing the current car and trailer (category B+E) test allows you to tow a trailer up to 3,500kg MAM. The test, which requires you to have previously passed a category B car test, involves off-road reversing manoeuvres and on-road driving assessments. *MAM, also commonly referred to as gross vehicle weight (GVW), is the unladen weight of the vehicle or trailer, and the maximum weight which can be carried in it. Drivers should be aware the 3,500kg weight limit for car-drawn trailers on UK roads includes the weight of the trailer itself. For example, the tri-axle cattle trailer pictured below, which weighs 1,500kg, is only able to carry up to 2,000kg. Trailer weights can vary depending on the manufacturer, so the VIN plate must be checked for its maximum payload. Different trailers are rated to carry different weights, with weights ranging from 750-3,500kg. Any trailer with MAM above 750kg requires over-run brakes to be fitted. Brakes must be in full working order; a working handbrake must also be fitted to the trailer. The trailer’s MAM must not exceed the vehicle’s towing capacity; if it does, the trailer requires down-plating to suit the vehicle’s towing limit. This can be reversed if a higher capacity towing vehicle is used, and can be done by a reputable dealer. Trailer MAM and vehicle towing capacity can be found on the vehicle identification number (VIN) plates. If the weight of towing vehicle and trailer exceeds 3,500kg, a tachograph will be required. However, exemptions from this rule exist if traveling less than 100km (62miles) from your base, when carrying goods in connection with your business – for example, cattle. For more information, see the links below. 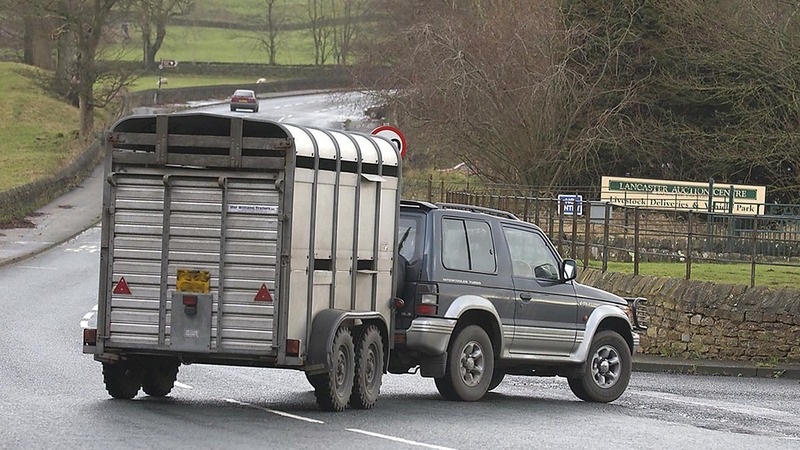 When towing a trailer, the speed limit on motorways and dual carriageways is reduced to 60mph, with a reduction to 50mph on single-carriageway A and B roads. Restrictions are also applied to trailer dimensions. The maximum width for any trailer is 2.55m (8ft 3in), with the maximum body length being limited to 7m (23ft), when towed by a vehicle weighing up to 3,500kg. Reflective marker boards at the rear and white marker lights at the front - to indicate the outermost parts of the trailer. All lights must be in good working order.